Starting a successful business is not going to make you happy. Entrepreneurship is so glamorized by the media, and I totally fell into that trap — I thought that having a profitable, seven-figure business would make me happy, but when I finally got there, I was more miserable than I had ever been before. It was a really confusing experience for me. I eventually learned that happiness is internal, not external. 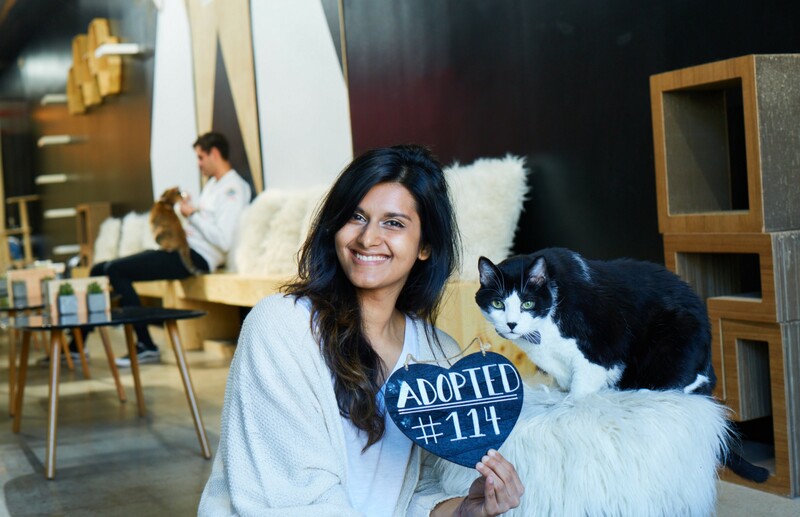 I had the pleasure of interviewing Kanchan Singh, the Founder and CEO of Crumbs & Whiskers, one of the first cat cafes in the country, and the first in Washington, D.C. There’s also a second busy location in Los Angeles, along with the just opened, first in the nation pop-up Kitten Lounge, also in D.C. Kanchan was born in India, and moved to the United States at age 14. 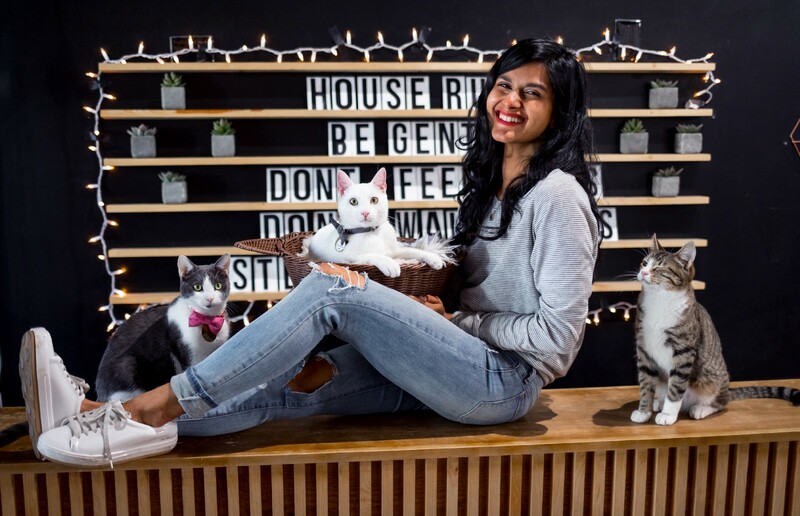 She founded Crumbs & Whiskers after quitting her job as a management consultant and raising $36K on Kickstarter. Crumbs & Whiskers tops seven figures in annual revenues, while remaining focused on its mission of helping homeless cats and facilitating connections between people and animals. Can you share your story of Crumbs & Whiskers? First can you tell us a story about the hard times that you faced when you first started your journey? When Crumbs & Whiskers first opened, it was so successful that I wished for all the success to stop. I had no idea how to handle it. Our reviews were awful because we were a mess, and we had no time to clean up our mess because we were always so busy. I stopped growing Crumbs & Whiskers two years into the company because I burned myself out and was extremely unhappy again. I got the drive to keep going because I was really passionate about what my company was doing. I knew that if I could work through the challenges, I could create something that was really impactful on the lives of shelter cats, and it could unite animal lovers in many different cities. So how did Crumbs & Whiskers lead to your eventual success? How did the business turn things around? A few ways. Above all else, I turned things around by going back to the beginning. I asked myself why I started in the first place. I started because I wanted to build an ethical business that helped save homeless cats. So I started defining what an ethical business looked like for me — what were the values that I wanted to reflect? What was our mission? I traveled back to our roots, which was our mission and values, and then built a company deeply rooted in those missions and values. It also took a lot of hard work, dedication, and self-reflection. I was the reason why we had our problems in the first place, so I spent a lot of time reflecting on my own limitations and my own issues. 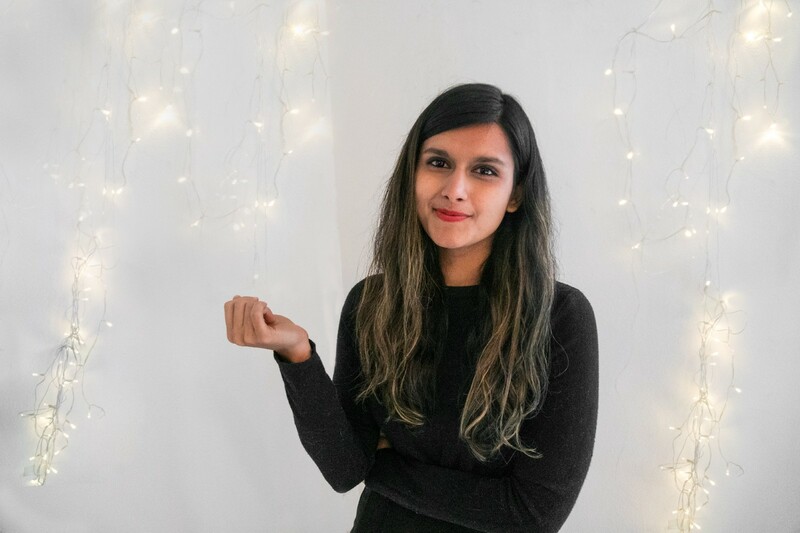 I recognized that I was getting in my own way, and addressed all my personal issues one by one — it was a piece-by-piece process where I worked really hard, with the help of my mentor, to change the way I was showing up in the business. Great! Of course, there are always areas for improvement, but things are much better today than they ever were before. Things are running a lot more smoothly now, our employees are happier, our reviews have never been better, and our turnover has never been lower. All our decisions as a company are now in alignment with our ethics — our mission and values. We are a company that is constantly aligned with who we truly are. I announced the cat café in DC shortly after I had the idea to see if I’d get any responses or enthusiasm for my idea. Within minutes, I was on the phone with a reporter from the Washington Post, and I was totally unprepared. The reporter asked me how I was planning on getting approval from the Department of Health. To sound like someone who had done her research, I told her I was in the process of figuring it out, instead of telling her that I hadn’t really been able to talk to the Department of Health yet. After our call, she called the Department of Health, and to her surprise, they told her they had no idea who I was. Not only that, the Department of Health publicly rejected my idea! It was the most embarrassing thing, hearing from a reporter rather than Department of Health, that my business would not get approved. I learned to be honest — to be with okay with saying that I haven’t worked out the details yet, but I’m getting to it. We stand out just because of who we are and what we do. 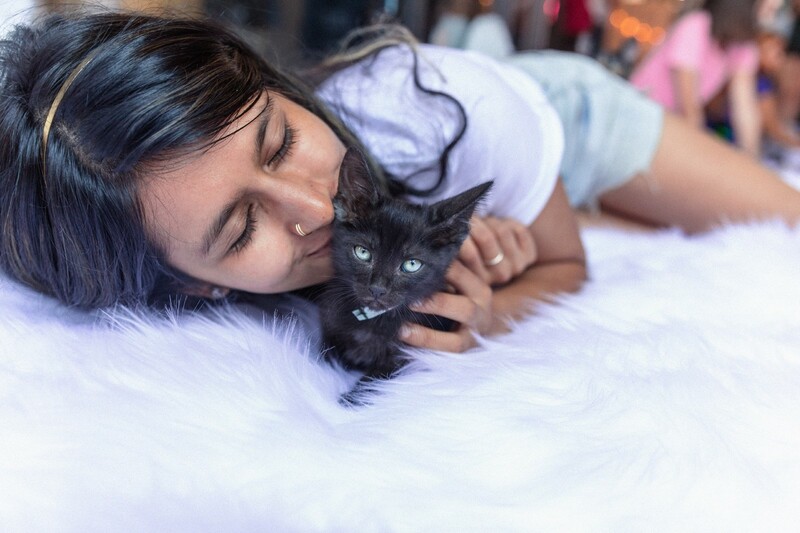 We are a cat cafe that’s built with a mission of helping homeless cats and facilitating connections between people and animals. It’s a rare, unique and fun business. A great story is when we first announced our cat cafe in D.C., we became the biggest media story in the city. Within 5 minutes, I had so many calls from reporters and I had no idea how to handle the media. My inbox was flooded — I had 6 pages of emails of people asking how they could get involved with the idea. D.C. was buzzing about the idea, in a way I couldn’t even imagine. Another great story is the day we launched our Kickstarter — we were funded overnight, which was really cool. I talked to lots of my funders and asked them why they funded us. They said it was because they wanted a cat cafe! So I think we stand out because well…we’re a cat cafe. Take care of yourself — really take care of yourself. There’s just no way you can take care of the business if you can’t take care of yourself. It starts with you. Find a great mentor or business coach who can support you and point out your limitations and blind spots. Do something that’s fulfilling. There’s no way to do well in business other than to be fulfilled doing what you’re doing, and to find great meaning in your work. Be grateful for everything that’s going well. There is always something going wrong, which is why it is really important to make sure to notice what’s going right. Appreciate yourself and your own work. If you can’t fully appreciate yourself, you can’t fully appreciate your employees. My mentor, Mary. Mary is one of the most important human beings in my life at the moment. She has helped me get to where I am today. When I started working with her a couple years ago, my business was in constant chaos. She taught me to see what my role in all of that was, and to address my company’s issues by addressing my personal issues. And the answer was a strong, hard no. Heeding her advice, I began to shift my relationship with myself by appreciating myself. It led to me appreciating others, leading me to take better care of my employees. Our success actually depends on bringing goodness to the world. It’s how my company is structured. Doing good is built into our business model. Thanks to our success, almost 2,000 cats weren’t euthanized in LA & D.C., and almost 1,000 people now have a new best friend. We also do charity initiatives. For example, when the Houston floods happened, we donated over $8,000 to animal rescue organizations saving animals caught in the floods. For Black Friday, we increased our prices and donated all proceeds from that day to shelters in their efforts to help black cats. We’ve done other company initiatives such as feeding homeless people’s pets, and delivering kittens to people who were having a bad day. (Choose) What are your “5 things I wish someone told me before I started my company” and why. Please share a story or example for each. 1. Starting a successful business is not going to make you happy. Entrepreneurship is so glamorized by the media, and I totally fell into that trap — I thought that having a profitable, seven-figure business would make me happy, but when I finally got there, I was more miserable than I had ever been before. It was a really confusing experience for me. I eventually learned that happiness is internal, not external. 2. Making the world a better place starts with changing yourself and making yourself a better person. I was very passionate about making the world a better place when I was younger. I focused all my energy on helping others, while totally neglecting myself. I thought that my needs could wait, because the world’s needs were greater than mine. Through a lot of painful experiences, I learned that you can’t help the world if you can’t help yourself. 3. Trust myself. Initially, I didn’t trust myself at all. I was a 24-year-old girl who liked cats and glitter — how was I supposed to trust myself? The business world was serious. So I followed other people’s recipes — I read books about CEOs and their cut-throat techniques, and then applied them to my business even though they didn’t feel right to me. I figured, they’re more successful than me, so they know better! I read all about what works, and replicated that, without once trusting my feeling that I wanted to do things differently. In the process, I burned my employees out, broke a lot of things and made myself miserable. It took me years to get there, but eventually, I learned to trust myself and to do what was right for me. 4. You can only become truly accomplished at something you love. For a long time, I wore a lot of different managerial hats in my company, but I didn’t enjoy those roles, and so I sucked at them. I was not good at being a manager. I was good at being an entrepreneur. I loved dreaming and creating, not planning and managing day-to-day responsibilities. When I realized I wasn’t good at what I was doing because I didn’t love it, I switched gears and hired the right people for those roles. Now, they love what they’re doing, and I love what I’m doing. 5. Don’t make money your main goal — pursue greatness, and the money will follow. I used to make money my main goal. I was willing to compromise on my ethics for the sake of money. I’d justify things that would stress our cats out, or overwork our employees, or compromise the quality of our services. I thought that was how anyone should do business, since cash flow is important. But I realized that chasing money was causing me to settle for mediocre. So instead, I began chasing greatness — great cat care, great employee care, great product/service, and I saw that the money automatically followed. Healing. I would start a movement around pursuing all kinds of healing — emotional, spiritual, physical, mental. What I’ve spent the most amount of time on over the last couple years is my own healing. It changed my life and who I am as a person. It allowed me to show up from a heart space, as myself. Working on myself showed me who I truly am. I feel that many of us are disconnected from who we really are. But, we can change that if we choose to heal ourselves. We would create a very special world if we all prioritized our own healing. Phil Laboon wants to live in a world where actions speak louder than words, people shout their stories from roof tops, and where following one’s passion is the norm. As a serial entrepreneur and investor, his personal and professional life has spotlighted in hundreds of publications such as People Magazine, Rueters, Forbes, Inc, HuffingtonPost, and CBS This Morning. Phil also writes a regular, nationally syndicated column on the subject of how great leaders build great companies. When he’s not building memorable brands or launching exciting startups, you can find him backpacking exotic countries looking for new inspiration and challenges. If you would like to book Phil for an entertaining speaking engagement about inbound marketing or growing a business, he can be contacted HERE.